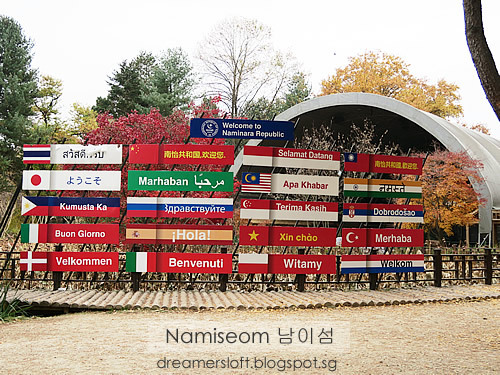 For our second last day in Seoul, I decided to visit Nami Island because it seems like a must-go place for first-time tourists based on what I read in blogs. 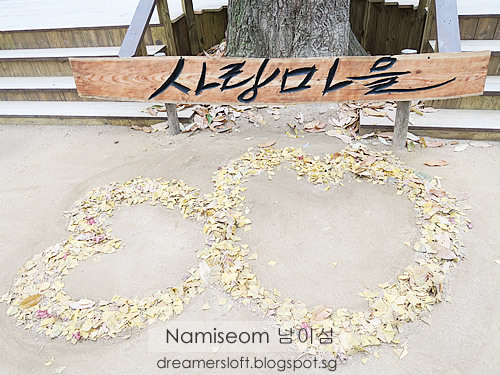 Apparently Nami Island was one of the filming site for a Kdrama "Winter Sonata" many years back. 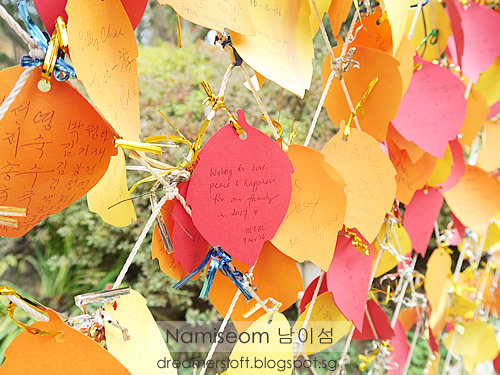 While I know about this drama, I wasn't really crazy for it. 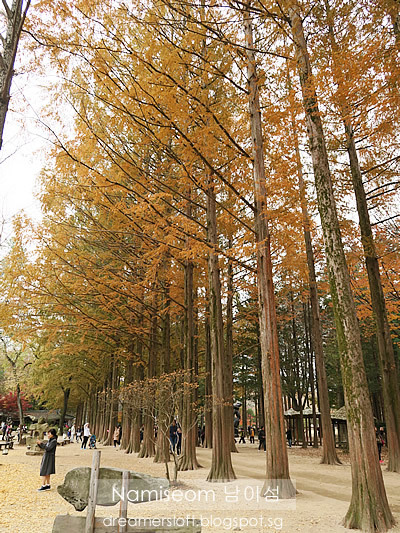 I guess I included this place because I heard that it's beautiful during autumn foliage and it reminds me of Miyajima island in Japan. 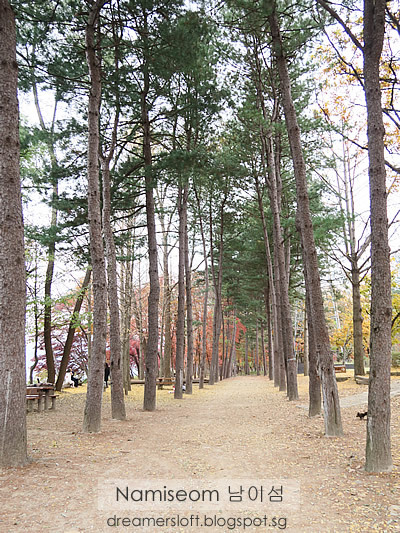 There's no direct way from Myeongdong or downtown area to Nami Island, unless I register for the direct shuttle bus service or private tour bus. But I find those options rather restrictive, departure timing is 9.30am whilst return is at 4pm (or longer), meaning we have to stay on the island for 4-5 hours or visit another attraction. 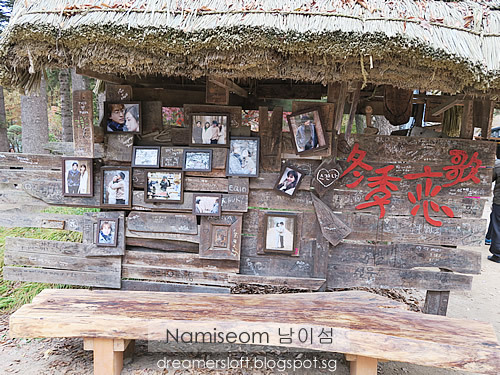 Many visitors would include Petite France (famous for another kdrama filming site) which is located 30 mins from Nami Island but I'm not including that in my itinerary. I don't think there are much things to do on the island and I figured we would finish touring the place in a couple of hours. Therefore, decided to go by train which is more complicated. 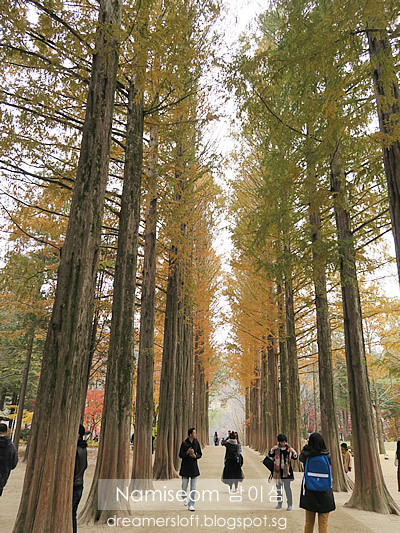 There are many blogs which provide comprehensive instructions so I think it's quite ok.
First we took the subway from Myeongdong to Yongsan Station (change line at Seoul Station). 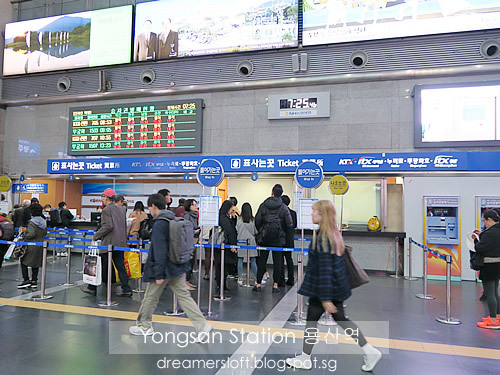 Upon reaching Yongsan Station, exit from the platform and proceed upstairs to the ticketing area. Find this big ticketing counter. 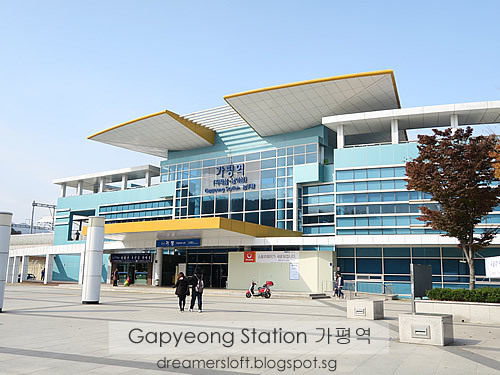 Basically we have to take a train (ITX-Cheongchun line) operated by Korail (http://www.letskorail.com/ebizbf/EbizBfTicketSearch.do) to Gapyeong Station and it's advisable to make online reservations to secure a designated seat as the train service is popular and seats might not be available especially in the morning. At the ticketing counter, exchange the train tickets using the reservation printout and passport that was used to register. 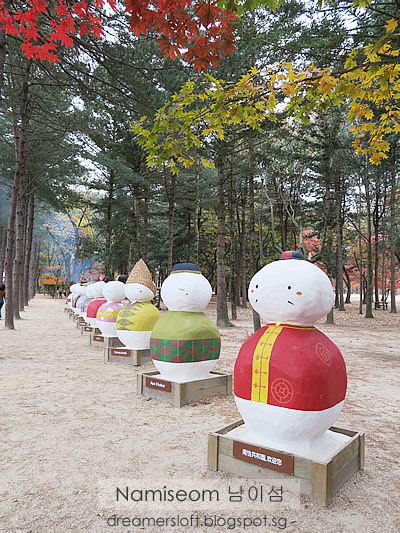 Booked the 8am train service so that we could reach Nami Island by 9am to avoid the crowd. Be sure to go to the platform at least 5 mins earlier because the train arrived 2 mins before departure time and leave the station promptly! It was quite crowded and the train platform seemed to be shared by a few trains so be careful to listen to instructions and look at the signboard for train service that's approaching. 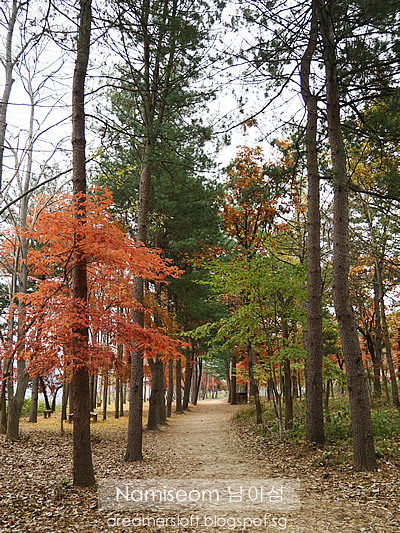 The train journey took almost an hour, and we reached Gapyeong Station, along with many other tourists it seemed. In front of the station, there is a Shuttle Bus queue and cab queue. 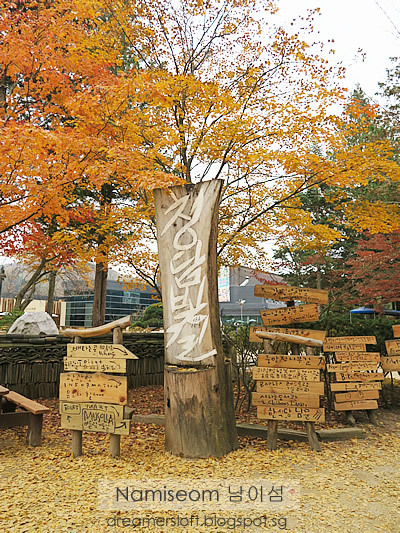 Shuttle bus fare is 5000 won per person per day (shuttle bus is loop service, meaning can visit many attractions around Gapyeong with one ticket). 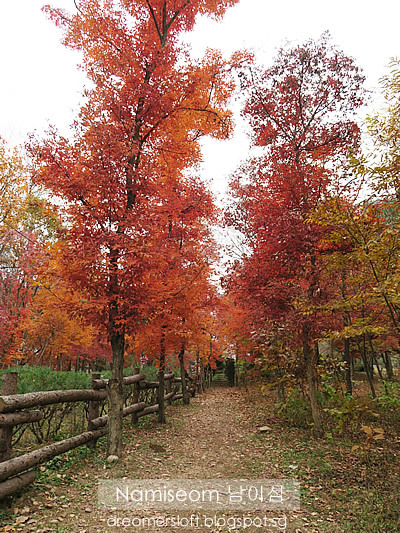 Since we were not going any other places, we went for cab which cost 3000 won (more worthwhile for us). 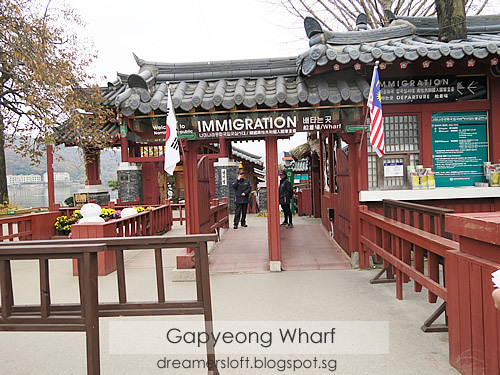 We reached Gapyeong Wharf in 5 mins and proceeded to the ticket counter for our ferry ticket. 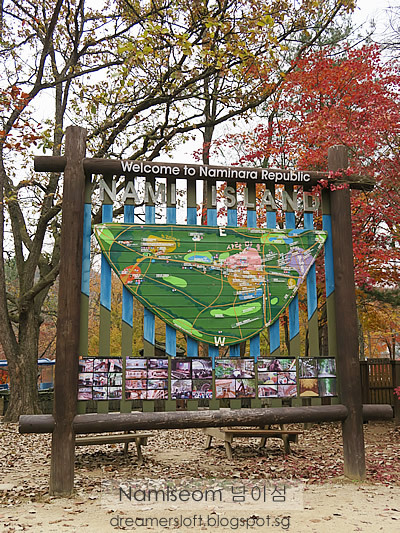 The signage says "Immigration" as they are marketing Nami Island as a country known as Naminara Republic. 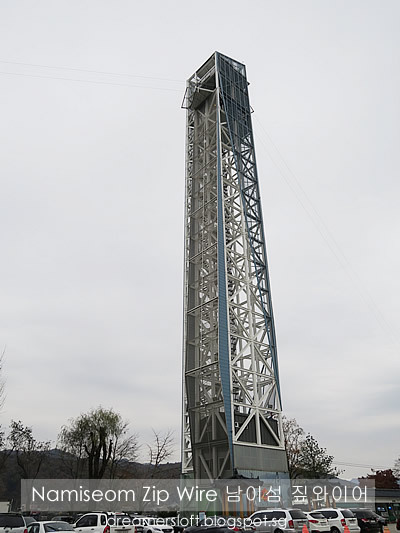 There's another way to get onto the island, via a zipline. Initially I thought of trying this, but the weather was quite chilly that morning, so after discussing with the hb I gave up. Regretted later on as I saw some people flying in and it looked so fun! 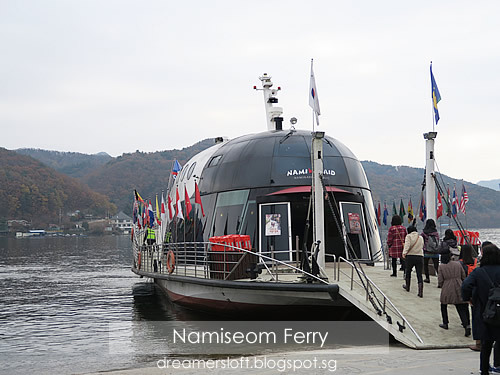 The ferry to Nami Island which took 5-6 mins only. Luckily we decided to travel early and the island was not that crowded yet. 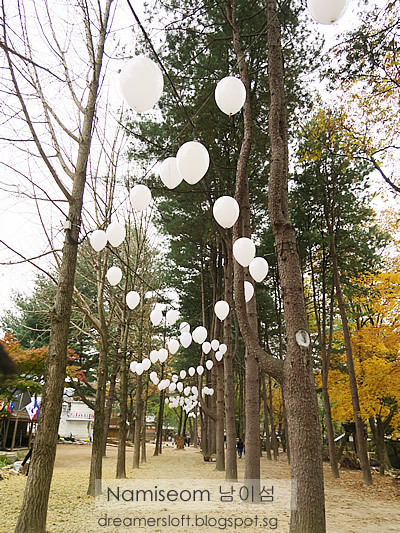 We could still enjoy the serenity of the surroundings. 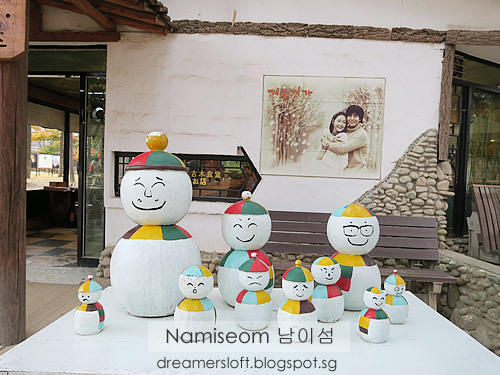 The island is quite small but there are several facilities and acitvities like UNICEF Charity Train, Bicycle rental, Electric Car-Tour Bus, handcraft studios, exhibitions, performances, restaurants, cafes and even a Hotel with guestrooms, bungalows and cottages. 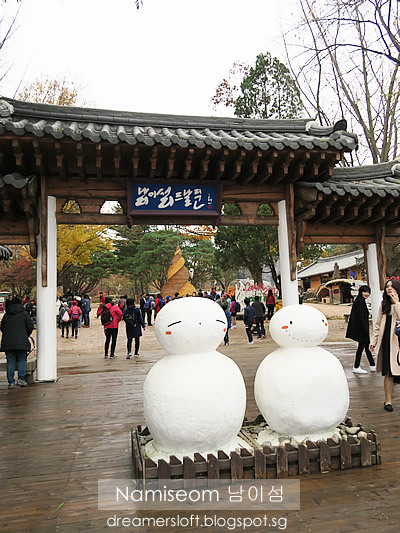 Snowman mascots everywhere. I guess the island is more famous for its breathtaking winter scenery? 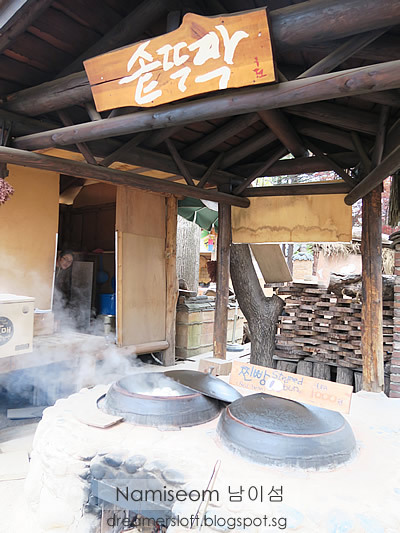 Steamed red bean bun for sale, using traditional firewood stove. 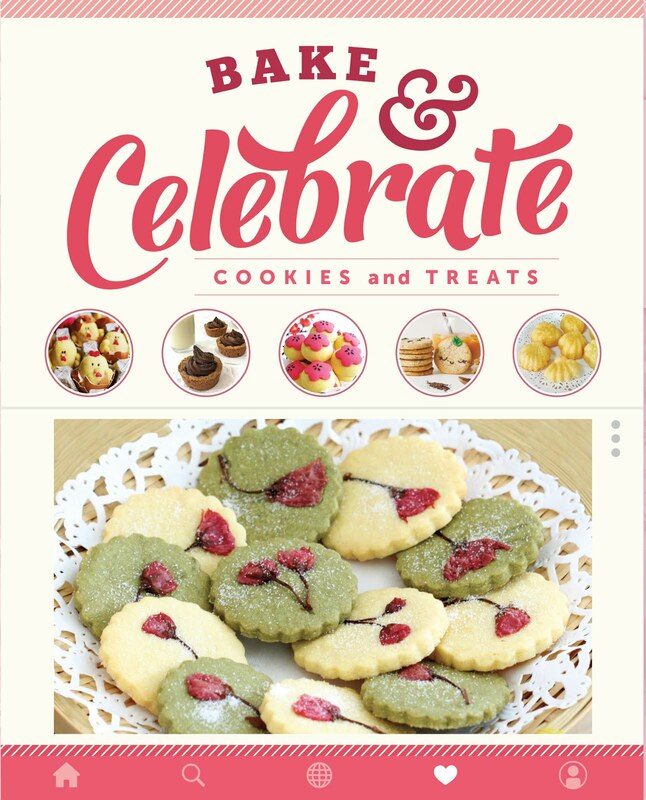 We bought one to try, not bad. 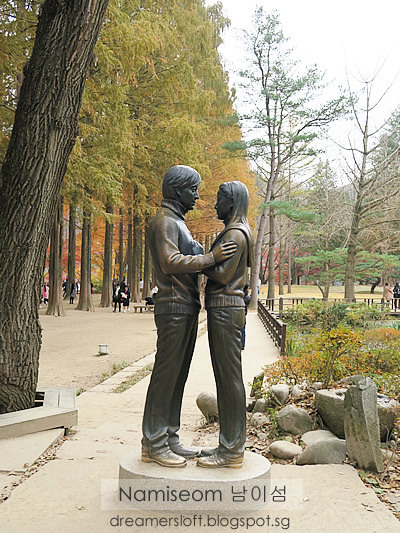 Photo-opportunity for fans of Winter Sonata. More and more tourists flowing in and it's impossible to take any photos without someone in the background. 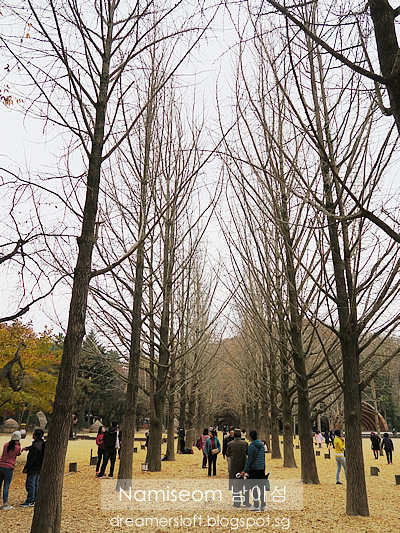 Another photo-opportunity for fans of Winter Sonata. 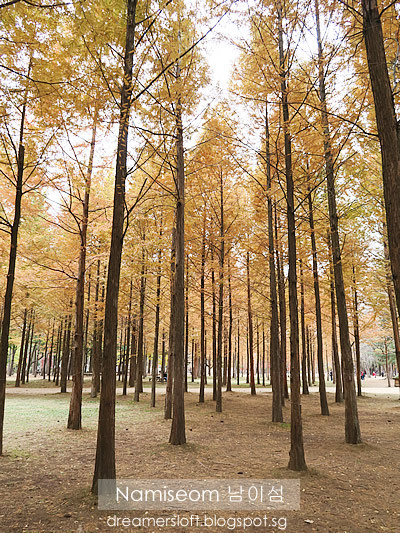 Lovely ambience and scenery here, just that there were too many tourists. Quiet area away from the crowd. 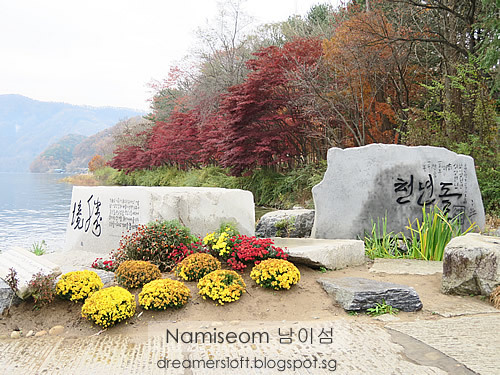 We were done by 11+am, our train back to Yongsan Station was booked for 12.30pm. Decided to take the ferry back to mainland in case there was a long queue for ferry. 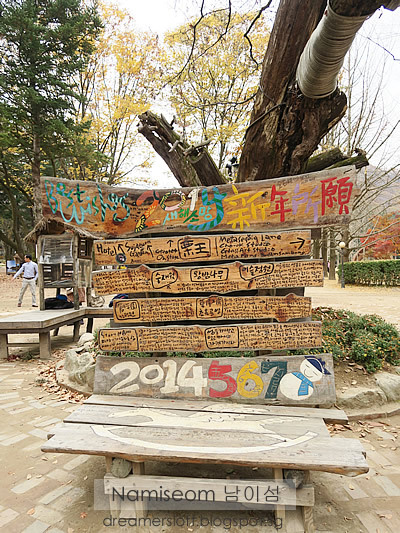 By this time, the island was super crowded with busloads of tour groups coming in. 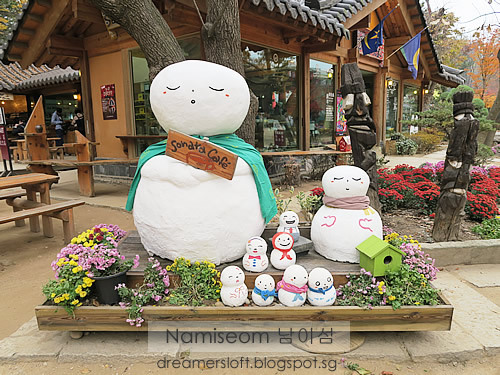 After reaching Gapyeong Wharf, we chilled at a cafe for a while before taking cab to Gapyeong Station and took the 12.30pm train back to Yongsan Station (remember to exchange the reservation slip at the station office). 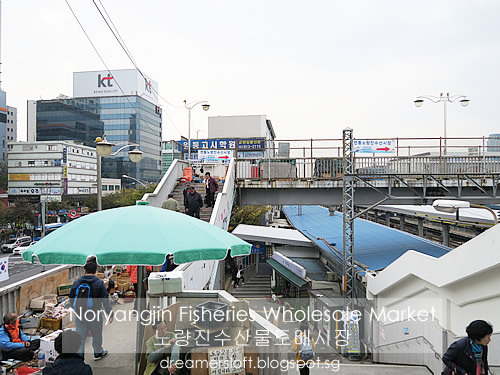 From Yongsan Station, we took the subway to Noryangjin Station one stop away. Exit at the right side and see an overhead bridge. 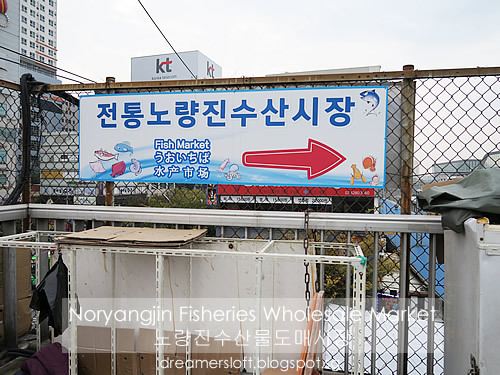 Signage showing direction to the Fish Market. 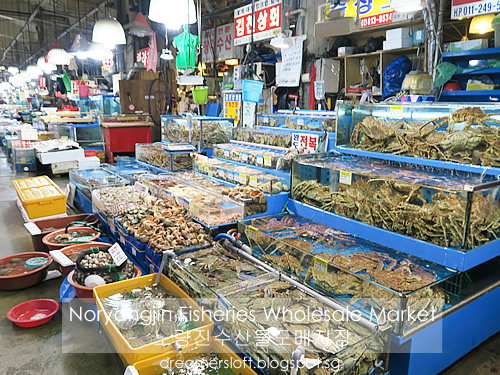 The Fish Market is huge! 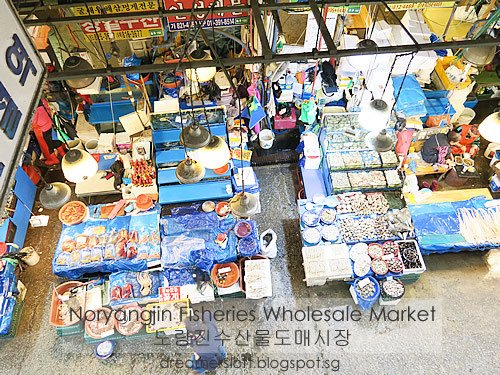 There must be at least a few hundred retail stalls alone, not counting the wholesale area. 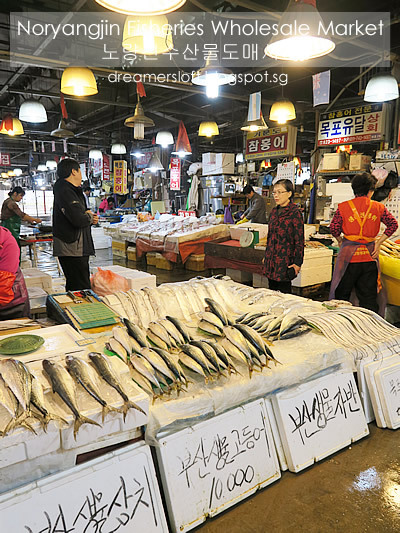 The seafood stalls sell almost similar types of seafood, from different species of crustaceans to different types of clams and shellfish. 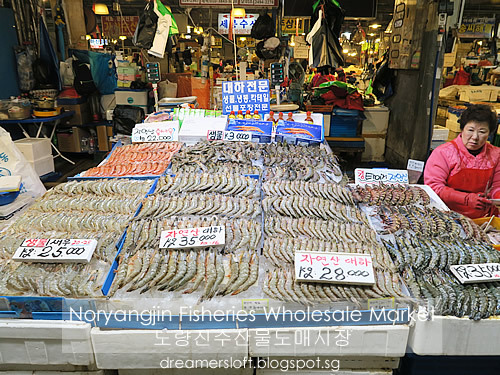 Some stalls specialise in shrimps. Frankly we didn't know which stall to select, so just randomly picked one friendly lady who spoke some Mandarin. 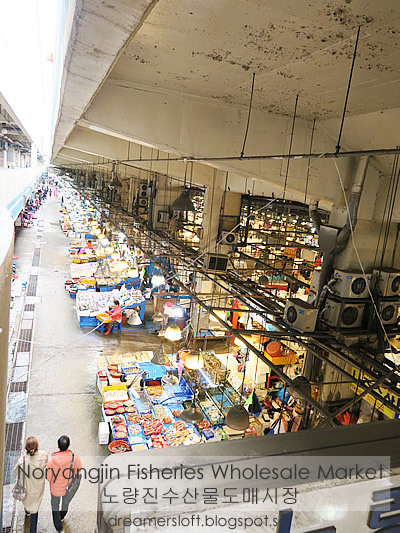 Actually a lot of stall owners here speak a little Mandarin so it was not difficult to communicate. Didn't bother to compare prices because we wouldn't know really. 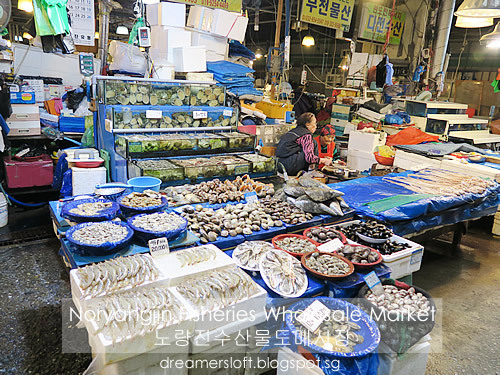 Most of the seafood stalls serving tourists are located on the first row, whereas the fish stalls where locals go are the next few aisles in the market. 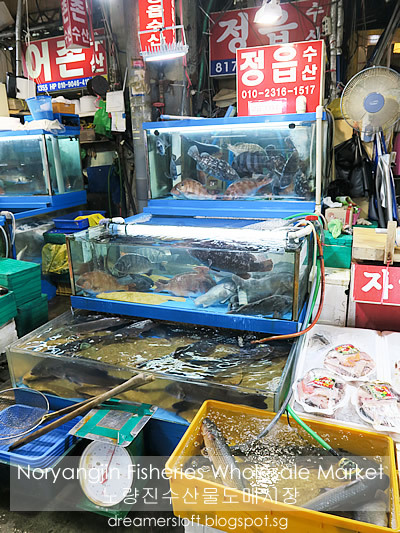 After selecting our seafood, we were led to a nearby restaurant where they would cook our seafood for a fee. 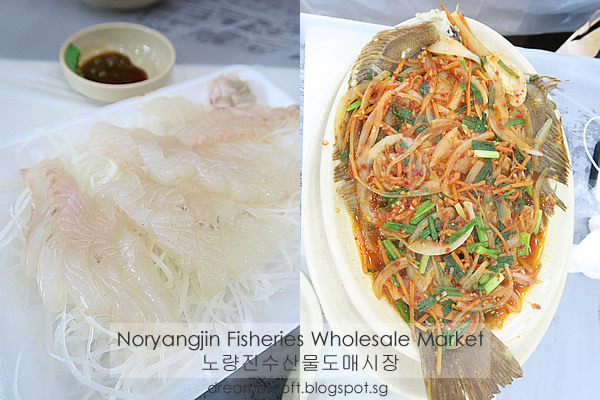 We chose a live flounder, half for sashimi and half steamed. This was my first time eating flounder sashimi, I love it! The meat was firm, bouncy and sweet! The steamed side was not bad, fish meat very delicate, but the spicy sauce was a bit overwhelming. 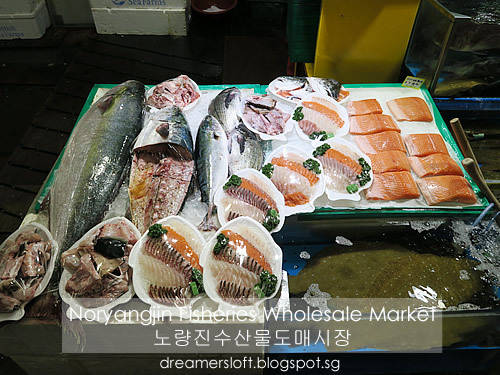 For such a fresh fish, if just steam with soy sauce (HK-style) would be nice. The cockles here were big, very sweet and juicy. The bamboo clams looked very fresh so we asked for some and the stall owner gave us a whole bunch! 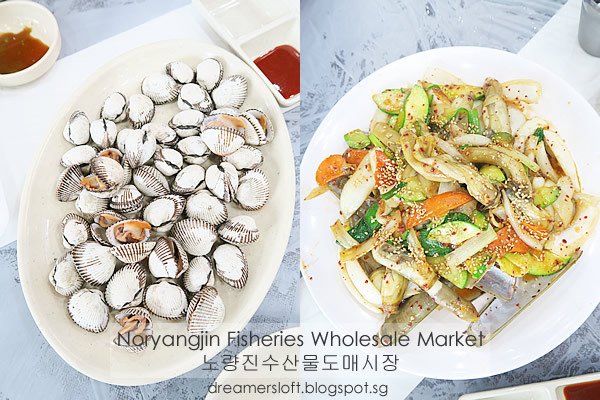 The clam meat was stir-fried with a salty-spicy sauce and some vegetables, not bad. 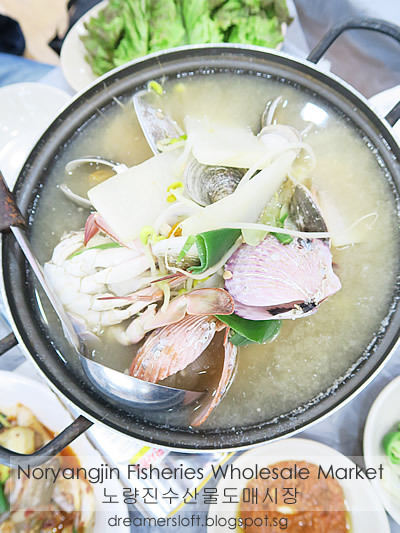 In SG, when we order bamboo clams, it's usually steamed in garlic and soy sauce and only one piece per person. Here there were at least eight pieces and the clam meat was so fat! It was quite shiok to eat a whole bamboo clam like this, but after my third piece, I couldn't take it anymore. Flower crab was in season, so we ordered one to cook with soup along with an assortment of clams. The crab meat was very sweet and tender, love it! I usually don't like to eat flower crab but this was indeed quite good. The soup was delicious too. 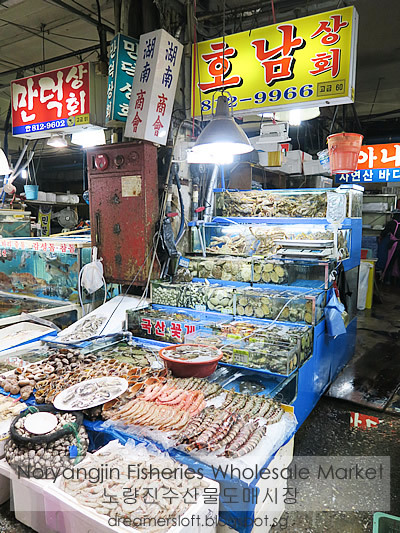 The meal didn't come cheap, but we enjoyed a sumptuous seafood meal. 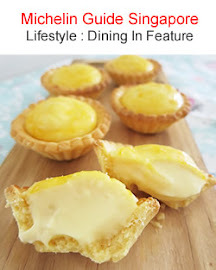 Not quite used to the style of cooking here, so I guess one-time experience is enough, unless we come with a bigger group of friends in future to share more variety of seafood. After lunch, we headed back to the hotel for a rest since we woke up early. 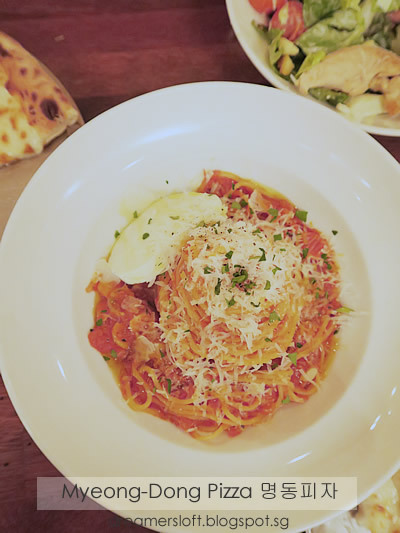 For dinner, we wandered aimlessly around Myeongdong area, had gotten a bit sick of Korean food, so decided to look for something western and chanced upon this underground pizzeria called Myeongdong Pizza (https://www.facebook.com/myeongdongpizza). 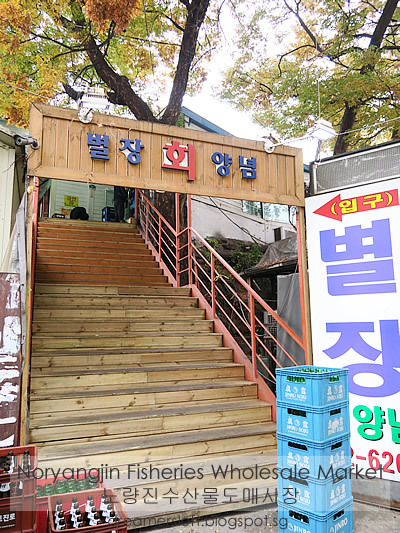 Quite a cozy little cafe, and the food served here was excellent I must say. Ordered a set meal of one salad, one pizza and one pasta. 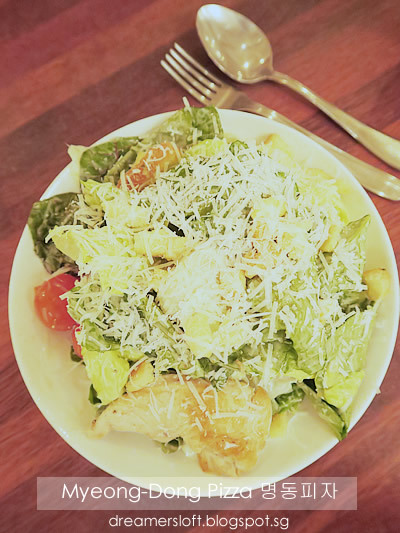 The caesar salad was well prepared, lots of greens, cheese and with a yummy sauce. The pizza was the star of this meal, we ordered a cheese pizza. 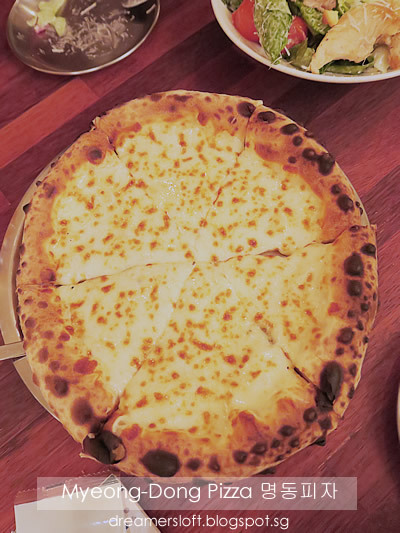 The pizza bread was so tender and fluffy and the cheese tasted mild, just the right taste for us. One of the best pizza we have ever eaten. Thumbs up! Tomato spaghetti was quite tasty too, spatting cooked al dente and the tomato sauce tangy and sweet. That concluded our last night in Seoul! 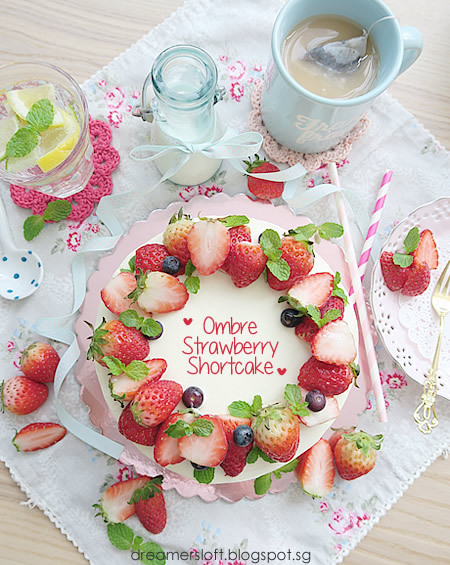 Stay tuned for the final post on Lotte Department Store - Supermarket and my shopping haul!